Referee magazine and the National Association of Sports Officials (NASO) are looking for high-quality men and women to join our team as full-time employees. We are growing and we need more people to help us educate and inspire sports officials across the country and around the globe. Click one of the job listings below to see more information. Racine, Wis. based company servicing the sports officiating industry providing content and services to a wide variety of sports organizations including professional leagues, national governing bodies and local organizations. Accountabilities include developing long-term relationships with a group of clients, connecting with key business partners, liaise between customers and cross-functional internal teams to ensure the timely and successful fulfillment of each partnership according to customer needs. Responsible for project-management, administrative and customer service duties, and sales and marketing. Must be a self-starter, highly-organized and detail-oriented with the ability to juggle multiple duties and responsibilities at once. Serve as the lead point of contact for fulfillment, service, and administration on a variety of key accounts. Build and maintain strong, long-lasting client relationships, including the development of trusted advisor relationships with key accounts, customer stakeholders and business partners. Ensure the timely and successful scheduling, fulfillment and delivery of our solutions according to customer needs and objectives. Develop new business with existing clients and/or identify areas of improvement to increase revenue. Provide primary sales support to Sales Director. Maintain and improve a variety of existing sales and marketing programs. Other sales, marketing, production and administrative duties as assigned. The position requires at least three years of experience in the field or in a related area, and a Bachelor’s degree is preferred. Candidates must become immersed in the sports officiating industry, quickly learning our industry’s concepts, practices and procedures pairing those skills with a strong proficiency in account management, project management and business administration to accomplish goals. Candidates must be self-motivated, and a wide degree of creativity and latitude is expected. Proven work experience as an Account Manager, or other relevant role. Ability to work within a variety of teams, rallying colleagues, and effectively managing personalities, deadlines and priorities. Solid experience with CRM software and MS Office (particularly MS Excel). Ability to prioritize among competing tasks. BA/BS degree in Business Administration, Sales or relevant field preferred. Salary is based on qualifications. We offer half-day Fridays, vacation, sick leave, paid holidays, and a competitive health and dental insurance plan. 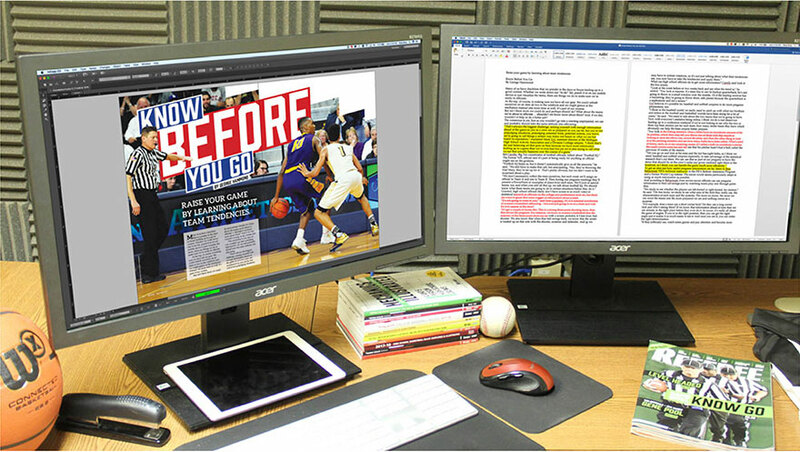 Last year alone, our company produced 12 monthly magazines, 48 monthly Referee/NASO print/digital newsletters, 50+ books, more than 100 client newsletters (print/online), thousands of pages of web/app content and a dozen training videos. We also manage NASO, the nation’s largest officiating education, protection and advocacy group – including its annual Officiating Summit. It’s a lot of work – challenging, inspiring, meaningful work. And there’s more work coming. That’s why we are aggressively expanding our team. Among the Editorial Team requirements: 1. Experience as a print and/or online journalist, with special emphasis on magazine and/or newspaper writing and/or editing. 2. Officiating experience, with emphasis given to those that officiate football, basketball, baseball, softball, soccer or volleyball and special emphasis given to those that are multi-sport officials. Because we interact constantly with our other sports officials in the building and with our other departments (creative, marketing, sales, customer service, etc. ), we want our employees working with us in the building. That means a relocation to Southeastern Wisconsin. Yes, we recognize that in today’s digital world working from afar is possible. (And we do use freelancers from around the country that do just that.) But for our team, the ones that produce and manage all of this content, the daily interactions mean something … they are invaluable. We want our key workers here. And you will want to be here. It’s the epicenter of officiating. These positions will garner a lot of interest – full-time jobs in officiating don’t come up very often. Don’t hesitate to contact us if you’re looking for a new challenge that takes you to new places – literally and figuratively. Thank you for your interest in working with Referee. Referee is an equal opportunity employer that is always looking for potential employees with officiating experience in addition to skills in writing, editing, publishing, design, marketing, sales, customer service and event planning.